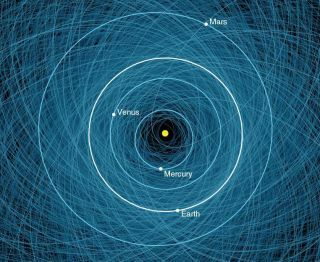 This NASA graphic shows the orbits of all the known Potentially Hazardous Asteroids (PHAs), numbering over 1,400 as of early 2013. Shown here is a close-up of the orbits overlaid on the orbits of Earth and other inner planets. The asteroid map shows a dizzying swarm of overlapping blue ellipses (the asteroid orbits) surrounding the sun. The orbits of Earth, Venus, Mercury, Mars and Jupiter are also visible to put the asteroid orbits in perspective on a solar system-wide scale. If you're worried about a rogue asteroid or comet obliterating life as we know it this week, don't panic just yet. Just because the asteroids in the new NASA map are classified as "potentially hazardous" — scientists call them PHAs in NASA-speak — that doesn't mean they are an imminent threat to the Earth, NASA said. This graphic shows the orbits of all the known Potentially Hazardous Asteroids (PHAs), numbering over 1,400 as of early 2013. According to NASA, "being classified as a PHA does not mean that an asteroid will impact the Earth: None of these PHAs is a worrisome threat over the next 100 years. By continuing to observe and track these asteroids, their orbits can be refined and more precise predictions made of their future close approaches and impact probabilities." NASA scientists and astronomers around the world are constantly searching for asteroids that may pose an impact threat to Earth. NASA has said that roughly 95 percent of the largest asteroids that could endanger Earth — space rocks at least 0.6 miles (1 km) wide — have been identified through these surveys. At the Jet Propulsion Laboratory, NASA's Asteroid Watch project scientists work to share the latest asteroid discoveries and potential threats with the public. The Asteroid Watch is part of NASA's Near-Earth Object Program that studies asteroids and comets, as well as their potential impact threats to the Earth and other planets.